My Annotated Bibliography of some literature on teaching using Video Conferencing (VC) over multiple campuses. In SD73, we have at least one VC equipped classroom in each high school. These rooms are used for teachers to teach with students in front of them and also at other campuses. Additionally, the rooms are being used to connect to other content providers to open the doors of the classroom. This is like a virtual field trip. Here is one example where our district is using VC to connect with experts around the globe. One of the best resources to connect to content providers is to visit http://www.cilc.org/ where you can search content providers you can dial into for virtual field trips. Armstrong-Stassen, M., Landstrom, M., & Lumpkin, R. (1998). Students' Reactions to the Introduction of Videoconferencing for Classroom Instruction. The Information Society, 14, 153-164. This article by Armstrong-Stassen et al. (1998), examines how university students react to videoconferencing as an instructional form. Students perceptions are taken at various stages in the completion of their course to gauge their acceptance of this as an instructional medium. It is a good study because it deals with many concerns that learners have related to videoconferencing. Although videoconferencing technology has changed alot since this articles publishing date, I still think this article's four major areas of concern are still true today. Gill, D., Parker, C., & Richardson, J. (2005). 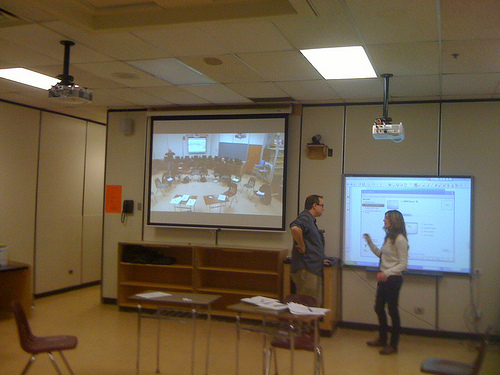 Twelve tips for teaching using videoconferencing. Medical Teacher, 27(7), 573-577. As the title of this article suggest, it gives the reader twelve tips for using videoconferencing from an instructors perspective. Videoconferencing is being used more and more across wide geographical sites to deliver courses. Gill et al (2005), breaks down many lessons that others have learned and put these tips together in a well organized list. The authors are very positive about videoconferencing and believe that teaching sessions can be delivered effectively and enjoyably. Knipe, D., & Lee, M. (2002). The quality of teaching and learning via videoconferencing. British Journal of Educational Technology, 33(3), 301-311. Knipe and Lee (2002) discuss how it is “naive to assume that merely linking distant groups or individuals at different locations creates an effective learning environment.” They are concerned that quality of teaching and learning is not always being considered when videoconferencing is introduced to an educational institution. Knipe and Lee examine diaries that students of a videoconferencing class kept to record experiences in this classroom situation. From these diaries, they conclude and explain why local videoconferencing students had a higher occurrence of learning over remote students. Freeman, Mark (1998). Video conferencing: a solution to the multi-campus large classes problem? British Journal of Educational Technology, 29(3), 197-210. This article found benefits to the use of videoconferencing, but his main criticism was that students and staff felt that lecturing learning activities and interactions were not improved by this mode of delivery. Freeman looked at videoconferencing and discuses the problems that staff encountered that led to distractions at the remote site. Concluding the article he outlines four recommendations that need to be resolved by technical staff and administrators. Dreyfus, H. (2001). Disembodied telepresence and the remoteness of the real. On the Internet (pp. 50- 72). USA & Canada: Routledge. Telepresence is an answer to the impersonal nature of distance education according to Dreyfus (2001). Using telepresence or videoconferencing, a teacher can change and acertain what is working or not working in a lesson and respond accordingly. This ability for a teacher to be able to notice social cues like mood, give them the advantage to respond and perceive the class environment more skillfully. Saw, K.G., Majid, O., Ghani, A., Atan, H., Idrus, R.M., Rahman, Z.A., & Tan, K.E. (2008). The videoconferencing learning environment: Technology, interaction and learning intersect. British Journal of Educational Technology, 39(3), 475-485. Saw et al. (2008) look at videoconferencing classes by examining the interactions that occur. They looked at teacher initiated interaction to whole class, teacher initiated interaction to a specific student, student initiated interaction to the teacher, and student initiated interaction to other students all via videoconferencing. The large amounts of data that is collected leads the researchers to three major findings that deal with technology configuration in a videoconferencing classroom. Anderson, T., & Rourke, L. (2005). Videoconferencing in Kindergarten-to-Grade 12 Setting: A Review of the Literature. Canadian Association of Distance Education Research: Centre for Distance Education at Athabasca University, Athabasca: Crown in Right of the Province of Alberta. Anderson & Rourke (2005), conducted a literature review of Internet Protocol videoconferencing from kindergarten through to grade 12. They look at six topics: outcomes, learning activities, interactive learning processes, keys to success, special populations, and equipment and technology. In their government conducted review, they attempt to collect information on videoconferencing for policy makers. They do conclude that the literature on Internet Protocol videoconferencing from kindergarten through to grade 12 is still relatively new and in the early stage of implementation. Distance education via videoconferencing is promoted as a way to free up students from the constraints of time and place to allow them to have easier access to education no matter where they live. Videoconferencing is being used to link rural learners with teachers and classroom communities. We really can't expect that just because learners at different sites are linked together with technology, that this will create an effective learning environment. There needs to be a number of things that are considered. Instructor and students need to have proper training and have timely access to technical support when problems arise. Instructional methods, strategies, and course planning need to be considered if they will function properly in a VC environment. Teachers need to make sure that they make connections with students at the remote site to make them feel as though they are part of the class. The technical setup and structure of the VC equipment needs to be done in a such a way as to make both sites feel included and part of the class. Videoconferencing will continue to change over time as the technology gets upgraded and there is no doubt that some of the concerns with VC will be overcome. But the most important piece to me is that VC create a cohesive classroom of students and a good learning environment. My Grade 8 Socials has just finished learning about European explorers. In the past I have had my students create trading cards for some explorers; much like hockey cards. This time I wanted to teach them to use Animoto and be creative in making videos. They found Animoto easy to use and I really didn't have to help them much on the tech side of things. One of the limitations of Animoto is the number of characters they can add into the presentation (its less than twitter). I told them to be careful with what they say and to be concise with their message. I actually found this to be good because they had to summarize very carefully; they could not copy paste from websites. I was thinking of getting them to make graphics and add text by using the Gimp image software program. This image then could be imported as a .jpg into Animoto. This would allow for more detailed text to be added to the video. Its and extra step and I might integrate it when I use Animoto next time. So below are a few of the animoto videos that students created. The class is seeking comments on their work. Well the class has just finished learning about the involvement of Louis Riel in the Rebellion of 1885. The students were in six groups researching the individuals on both sides of the rebellion. From their research students then showcased their learning in an Animoto video that they created. Initially, Animoto was not working at our school because of the proxy server restrictions that were set. However, with the help of the district tech guys, we got this working. The only part not working is the ability to listen to the music choice in Animoto...somehow you can't listen to your music before you select it. Hopefully we can get this resolved soon. So below are the six animoto video. The class is seeking comments on their work. Thanks for looking at them, please leave some feedback below!